Munther was born in Beit Sahour, Palestine. He is married with two children. Munther is an ordained minister of the Lutheran Church and serves as an Assistant Pastor at Christmas Evangelical Lutheran Church Bethlehem. 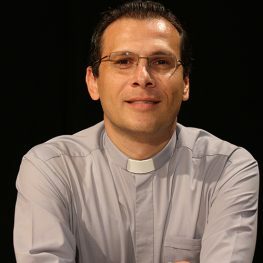 Munther is a speaker on Palestinian theology and the theology of the land, active with Kairos Palestine, and Blogger. Isaac, Munther. From Land to Lands, From Eden to the Renewed Earth. London: Langham Monographs, 2015. Isaac, Munther. “Arab Christian Fundamentalist Reading of the Book of Daniel: A Critique.” Edited by Mitri Raheb. Bethlehem: Diyar, 2012. Isaac, Munther. “Reading the Old Testament in a Palestinian Church Today: A Case Study of Joshua 6. .” In The Land Cries Out: Theology of the Land in the Israeli-Palestinian Context. Edited by Salim Munayer and Lisa Loden. Eugene, OR: CASCADE Books, 2012.